Enter Gokomachi-dori, just off the Kyoto Shiyakushomae Station stop, and head southward for about five minutes on foot. Right next to TULLY’S COFFEE, you will find Osugi Shoten, which carries antiques dating from Japan’s Edo through Taisho periods. Osugi Shoten is located in a traditional machiya townhouse, an austere and quiet presence amidst bustling cafes and vintage clothing shops. The shop may seem a bit intimidating and prestigious, so perhaps you’ll hesitate to enter. But don’t worry! There is nothing to be afraid of! The shop is home to a range of antique vessels and items, an inviting and warm space created by the gentle proprietor. Osugi Shoten is definitely recommend for beginners to the antiques scene. The shop’s ethos is about having more than just important and expensive antiques that are for a rarefied few. They also stock items that are enjoyable for everyday use out of the hope that more people will incorporate antiques in their lives. The owner will gladly go into detail about each and every item. If there is anything you’re unclear on, do not hesitate to ask him questions. 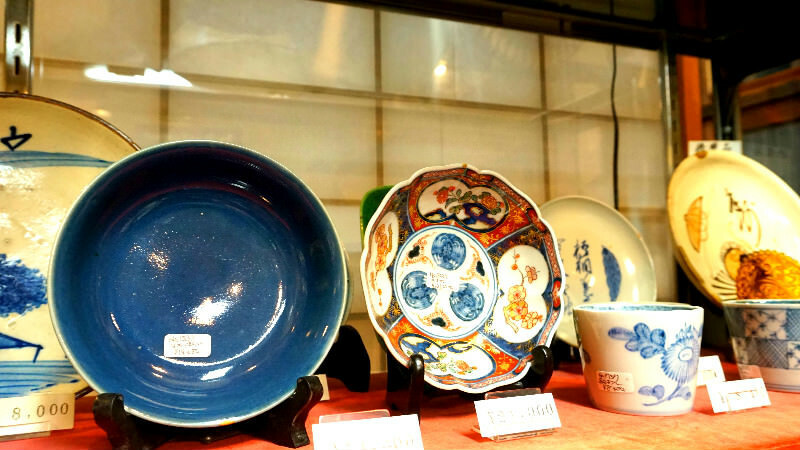 One great thing about Osugi Shoten is that everyone who visits becomes enchanted with the world of antiques. This is owed to the owner’s enthusiasm and passion for the subject. He will treat you to all sorts of lore and gossip, and his love for the subject is quite evident. As you listen, you come to realize how rich and interesting the world of antiques is. By the time you have left Osugi Shoten, you’ll be a diehard fan of the place. You’ll already be thinking about coming back again. There’s a mysterious energy about this place that keeps you coming back. That’s Osugi Shoten in a nutshell -- an inviting and fun place with a passionate owner. If you visit Kyoto, you must stop by here. This larger Imari ware plate has a lovely contrast of red and blue. The gold decorations throughout lend it a lovely sparkle, enhancing what is already a beautiful dish. Measuring 21cm round, the pattern is bold and has a signature exotic Asian feel. This plate has quite a presence on the table, like a painting in its own right. An item like this would be great for serving food or for decoration. In contrast to the gorgeous plate described above, another fun find at Osugi Shoten are pieces like these sake vessels in a cute size and amusing patterns. All are hand-painted, so you will find variation in the flower shapes and faces. It’s as if each piece is alive and has its own identity or expression. They’re really charming! Their small surfaces feature detailed little images of Japanese gods and ancient Japanese figures. Amidst their singular beauty, they have a little twist that is sure to enchant you. You may find ceramics to be too fragile to use on a day-to-day basis. If that sounds like you, you have to try traditional Japanese lacquerware. Lacquerware is not prone to breakage, is lightweight, easy to handle, and does not conduct heat, so it’s great for bowls of soup, which you can hold without getting scalded. That makes lacquerware highly practical and good for everyday use. Popular are small plates and bowls -- they will make Japanese food and sweets, as well as Western food, look beautiful, so you can use them to your heart’s content. Apparently people find all kinds of uses for these durable items, such as buying plates for laying out barbecued food, using smaller ones for their children, and so on. The shelf to your right when you enter the shop features repaired items mended with the signature Japanese “kinzuki” technique. These are offered at a discount, so have a look! While technically “flawed,” you shouldn’t consider these products in any way inferior. In Japan, there is a totally different approach to the way these products are viewed. Broken vessels are repaired with a traditional technique where golden veins are used to patch the seams. When a piece of lacquer chips or breaks, the opening is layered over with gold pigment, enhancing and repairing it. In this way, a broken vessel is reborn as a one-of-a-kind work of art. This section is stocked with a rich array of these beautiful pieces. You’d be mistaken to think of them as cast-off rejects! In fact, you may just find a very special something that you love. This is your chance to find something special! The motifs you’ll find on the antiques are hand-painted, so each and everyone one is unique. The shop owner is very kind and friendly and will likely invite you to step up into the inner room to arrange various vessels for you on a table. He will give you helpful advice to aid your decision. Take your time to line the pieces up and give them a good look to find the one that really speaks to you! This shop lets you enjoy a range of wares, whether you are a newbie or advanced lover of antiques. The owner is very friendly and kind and goes into great detail about each item, so you can find just the piece you want or need. The owner used to live in Hawaii, so he speaks English! This makes Osugi Shoten great for people from everywhere! 6-minute walk from Hankyu Kawaramachi Stn. 7-minute walk from Subway Tozai Line Kyoto Shiyakusho-mae Stn. Note that the shop is closed between 12/31 and 1/3. The owner is very friendly and speaks English. This will let you mull your purchase while the proprietor gives you all the details on the types of vessels and antiques on offer, so this would be a great shop for beginners looking to make a safe purchase.